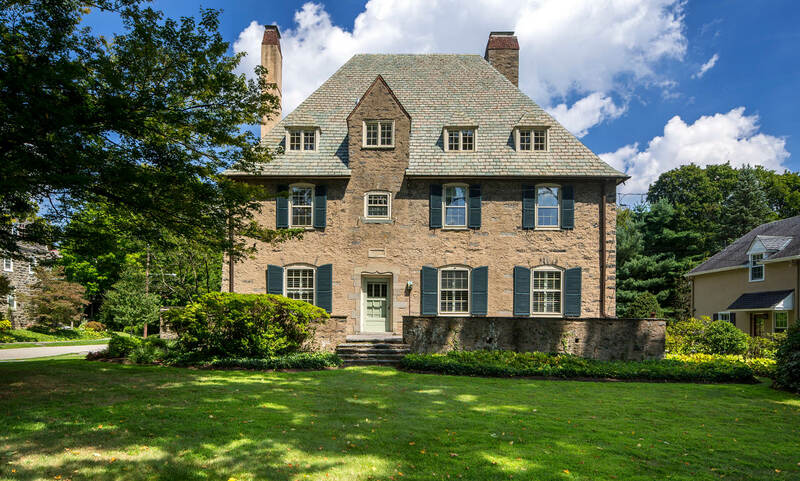 Immaculately maintained 6 bedroom, 3.5 bath Normandy-style stone Colonial in the heart of Chestnut Hill. The beautiful original details of this home such as deep windowsills, original fireplaces and high ceilings have been lovingly updated and combined with more modern features such as an updated kitchen with custom cabinetry and large pantry, new baths, refinished hardwood floors, tankless hot water heater and new central air (2016). The formal dining room has French doors that open to the sunroom with rear yard access. The large, formal living room with fireplace offers beautiful windows with deep sills and a cozy sitting room across the hall, also with fireplace and built-in shelving. A large powder room off the hall offers additional storage and shelving. The first floor offers a convenient family entrance off of the garage that opens to the sunlit kitchen with breakfast room, pantry with additional storage and laundry room. Upstairs, a spacious family room with vaulted ceiling is accessed by the rear stairs and provides a private spot for entertaining family or friends. The huge master bedroom offers a private deck, 2 walk-in closets and new full bath with stall shower and tub. An additional bedroom on the second floor offers a new full bath and large sitting room with fireplace. A convenient and sunny office completes the second floor. The third floor offers 4 additional bedrooms, full hall bath with clawfoot tub, cedar closet and ample storage possibilities. The spacious rear yard has a slate terrace for entertaining and mature, specimen plantings. Located in a walk-to-everything location near Chestnut Hill restaurants and shops, Fairmount Park, the train to Center City and a just a short drive to major highways.